Currently we have a small den that, bit by bit, we hope to transform into an Art Deco style home theater. After saving up for a while, we finally we able to place an order for a new sofa, loveseat, chair and ottoman in red velvet from CoolSofa.com... I am so excited! Check it out!!! 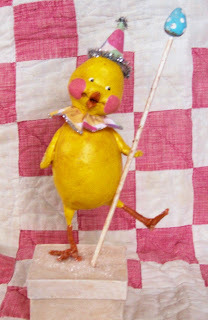 In case anyone wanted to sculpt their own little party chick ... here is the way I made him. To begin, you will need paper clay, sculpting tools, water, a small flat paintbrush and a Styrofoam egg and ball, paper tape and 20 gauge floral wire. Begin by twisting and shaping wire into bird feet and legs. Cover with paper tape. 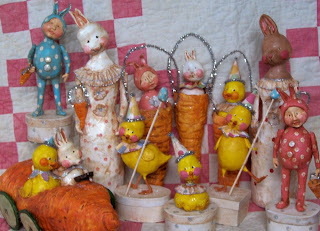 Soak Styrofoam egg in water and then cover with paper clay, smoothing and shaping with your hands and paintbrush. 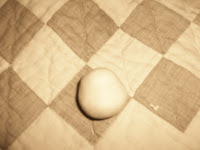 Insert legs into bottom of egg, and pose in any fashion you choose. Indent Styrofoam ball with smooth barreled paint brush handle or a smooth barreled pencil. 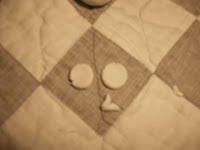 Shape Styrofoam to create a head shape. Soak Styrofoam head in water and cover with paper clay forming a smooth surface with hands and brush. 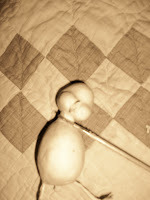 To create the face, form two small balls and 2 small cone shapes. 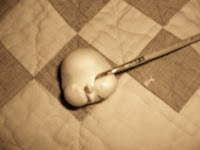 Flatten balls in to "puffy pancakes" and attach to head, one on each side, to create cheeks. Attach cone shapes to create beak. Smooth face with paintbrush and water. Shape beak with sculpting tools and paintbrush to create a smile. 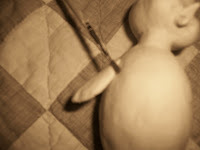 Using paper clay, create a small barrel shaped neck to attach head to body. Smooth with paintbrush and water. Adding a wire here also adds extra strength to your piece. You can tilt the head to the side to add some personality. 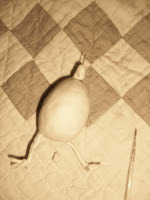 Shape wings and attach to chick body with paintbrush and water. I didn't take pics of the painting process, but I recommend that you let the chick dry for a least week before painting. I always gesso paper clay before painting with good quality acrylic paints, and finish the pieces up with a matte acrylic sealer, which is then antiqued with watered down burnt umber paint. After I attached this chick to a hand painted paper mache box, I added just a touch of glass glitter here and there to give him a little sparkle. I hope you have fun with your creations! If you decide to make one I'd love to see the finished pics! Been busy whipping up some Easter goodies for the website and for my Glitter Feburary page ! I also am so excited to announce that I will be joining the fantastic PFATT Marketplace in February!!! I am truly honored to be in the company of the incredible talent there and at Glitter and Grunge ! I'll have a sneak peek of the items I'll be crafting for my page at PFATT soon! As for this Party Chick... I took some pics of him while he was "under construction" and will post a tutorial later this week! Thanks again to everyone who left such sweet comments about Nana. Your lovely thoughts brought happy tears to my eyes. I think almost every person has had someone in their life that inspired them. For me, it is my Nana. 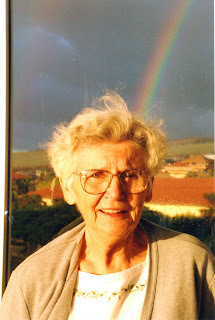 Nana passed away on the 4th of July 2004. She was a painter, a sewer, the world's most fantastic cook and a strong Christian woman who drove herself to Bible study every week and went to church Sundays without fail. In Nana's desert garden, she could grow almost anything, oranges, tomatoes, even lavender! 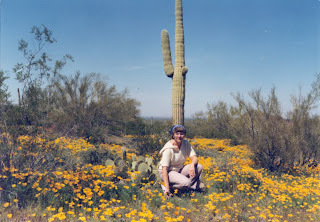 When I was a teen, I spent time in the summer at my Nana's house in Tucson, Arizona. A typical day at Nana's invariably included a hot breakfast (with bran muffins... Nana was all about balance! ), a trip to the thrift store, the library, and then the video store to rent wonderful old movies like The Shop Around the Corner and Meet Me in St. Louis. After a yummy lunch of sandwiches (with sprouts! ), we'd go for a swim. An energetic person, Nana swam everyday, and went skiing for the first time of her life in her late 60's! 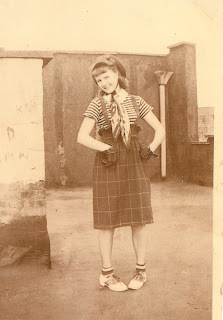 In the late afternoon, Nana would put the kettle on, and we'd have shortbread cookies and cream in our tea. For dinner we'd get a pizza or Nana would whip up something wonderful, always, always, always followed by homemade cake! 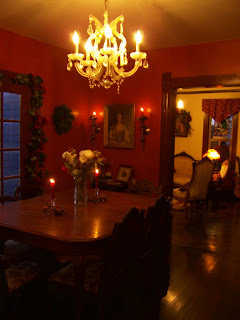 After dinner, we'd get comfortable in the family room and read, or watch movies. 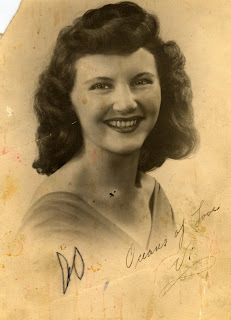 Sometimes, Nana and I would stay up past midnight immersed in conversation...she recalling life during the depression and the war, what is was like raising my dad and his brother and sisters in the 50's, choices she had made, both good and bad, our favorite books, even politics and religion. I had a wonderful conversation with Nana a few months before she traveled to her "forever home". 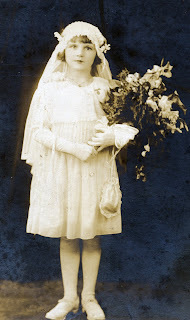 She knew, at that time, what she was facing, and looked forward to meeting up again with the friends (and my grandfather) that went before her. She was excited, curious and admitted her slight fear. A few weeks before July 4, 2004, she gave me the most beautiful Turquoise bracelet. The bracelet was an heirloom, handcrafted by a Native American artist from a local tribe that had been given to her by my grandfather decades before. It's amazing... the comfort that small bracelet grants me when I have had a bad day or am fearful in anyway (like when I fly!). Nana's grace, courage and beauty inspire me daily to create, to pray, to show kindness, to relish the process of making meals for my family, to enjoy indulgent foods, but to balance that pleasure with vegetables and exercise. She was a women with a life well lived, full of friendship, spirituality, creativity and the people she loved. The Rules:Each player of this game starts with "6 weird things about you". Each person who gets tagged needs to write a blog post of their own 6 weird things as well as clearly state this rule. After you state your 6 weird things, you need to choose 6 people to be tagged and list their names. Don't forget to leave a comment that says "you're tagged" in their comments and tell them to read your blog for information as to what it means. 1. My musical tastes: If someone opened up my CD case, they'd get to choose between the Beastie Boys , the Glen Miller Orchestra (Big Band) and Broken Social Scene (indie band from Canada). 2. My food tastes: On the rare occasion that my husband and kids aren't home for dinner, I prepare and eat my favorite meal...green apples, cheese and crackers, and Ben and Jerry's Chocolate Chip Cookie Dough ice cream. If there are no cheese and crackers in my house...then a loaf of Sourdough bread with butter would be my next favorite choice! 3. Even though I am not a Southern California resident, I have probably driven (7 hours) to go Disneyland at least 20 times in the past 3 years. With and without (shhhhhhhhhhh, don't tell them) my kids! 4. When I was little, I used to insist that my name wasn't Jennifer, but that people should call me Darla. Speaking of "Jennifers", I have about 10 friends also named Jennifer.... most born in the late 60's early 70's....anyone out there know why there are so many of us??? 6. Yours truly, a thirty-three year old woman, is currently fulfilling a life long dream by learning how to tap dance! took just before Christmas. More to come soon! 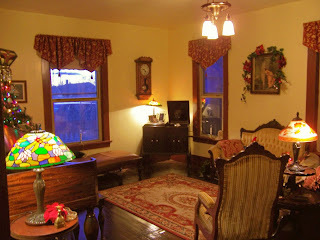 Here's the front room, or "parlor". Yes that's a gramophone in the corner! I had been collecting old big band, blues, and swing music on 78' records for years, and when we bought his place, the former owners left the gramophone behind! 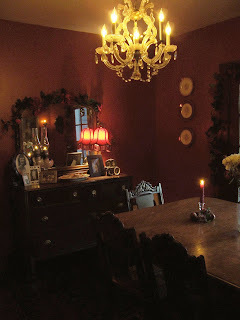 Our candle-lit dining room, my favorite place to be! Thanks again to everyone who has stopped by and said hello! I'd love to exchange links with you all, please let me know if it's okay to post links here to your blogs and websites :-). So, inspired by the wonderfully talented Jenny at Everyday is a Holiday..I have decided to get aboard the blogging train. I'd love to post every few days, and have a blog that looks almost as good as some of the gorgeous ones I have been lurking at for the past month or two. For this first post I think I'll share a picture of one of my true loves... my home. A drafty old, paint peeling, creaky blue Victorian in a mountain village town. Whew! That sounds wayyyyy more romantic than it really is ;-)!